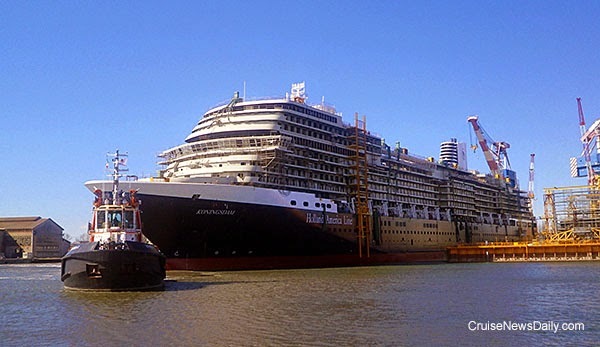 Fincantieri floated out Holland America's Koningsdam from the dry dock this week. The ship was towed to the outfitting dock at the Marghera (Italy) yard. It will remain there until the ship is delivered in March 2016. Photos courtesy of Holland America Line. All rights reserved. May not be copied or used without permission. 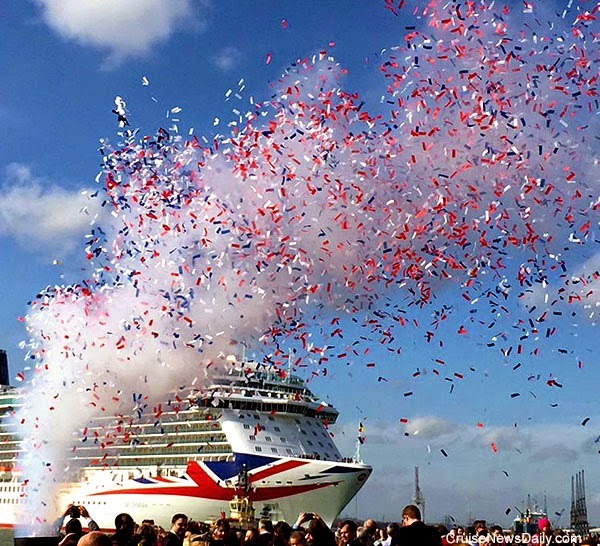 P&O's newest ship, Britannia, arrived Southampton this morning for the first time to await her official naming on Tuesday by Her Majesty The Queen. 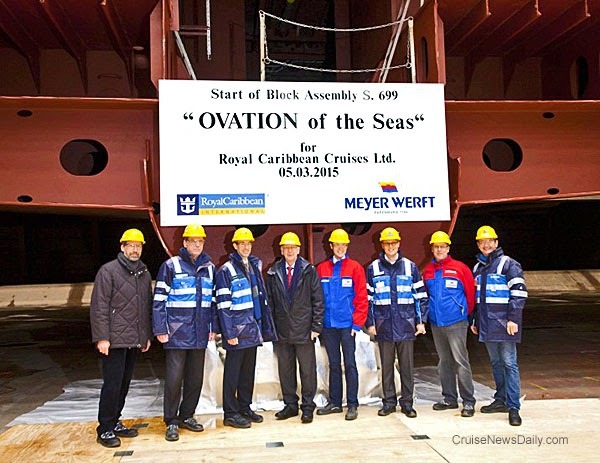 Assembly of Ovation of the Seas began today in the covered building dock at Meyer Werft in Papenburg (Germany). Royal Caribbean President and COO Adam Goldstein placed the lucky penny in the dock before the first block of the ship, weighing 740 tons, was lowered onto it. 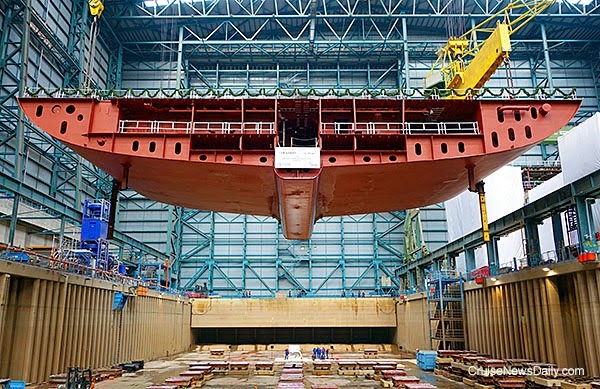 The 168,600-ton ship, the third in the Quantum-class series, will be delivered in the spring of 2016. The first of 74 blocks is lowered into place. placed below the keel for good luck. Royal Caribbean released their Caribbean deployment plans for the winter 2016-2017 season this morning, and the biggest news to come from it is that during the winter they will have all three of their Oasis-class ships in the Caribbean. The new Harmony of the Seas will join Allure of the Seas at Port Everglades for seven-night eastern and western Caribbean itineraries. Oasis of the Seas will sail alternating 7-night eastern and western Caribbean cruises from Port Canaveral. Royal Caribbean clearly indicated that the Central Florida port is Oasis' "winter home," so the speculation continues where it will go at the end of the season. 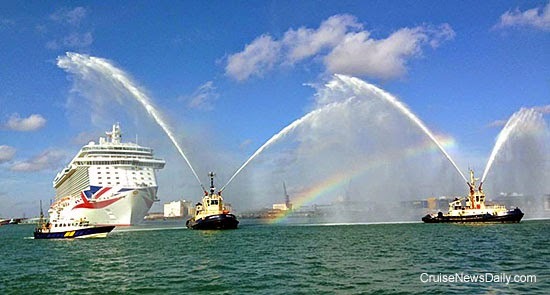 The complete article about Royal Caribbean's Caribbean deployment will appear in today's edition of Cruise News Daily. One more look at Royal Caribbean's Anthem of the Seas floating out at Meyer Werft. This time Royal Caribbean has provided the numbers. Norwegian Cruise Line Holdings announced the appointment of long-time sales executive Andy Stuart as president and COO of Norwegian Cruise Line, following the resignation of Drew Madsen. Anyone who thinks China will eventually develop into a huge cruise market is wrong. It already is a huge cruise market, and it already has a very affluent sector to it. Evidence was seen Sunday when Costa Atlantica sailed from Shanghai with nearly a thousand Chinese passengers on an 86-day world cruise. 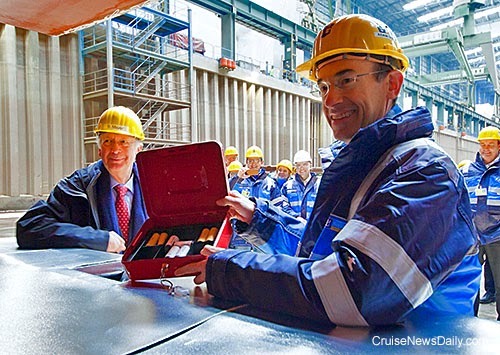 Seabourn has opened the books on the inaugural season of their newest ship, Seabourn Encore. The season will run from December 4, 2016, through April 2017. Details were included in the March 3 edition of Cruise News Daily. Crystal Cruises' parent, NYK, said this morning they will sell the cruise line to Genting Hong Kong, the owner of Star Cruises and a major shareholder of Norwegian Cruise Line Holdings. Genting said they plan to expand the luxury line by ordering a new ship, but did not set a time frame for the newbuild, but said the plan to purchase the line would close in the second quarter of this year. Next spring, change will be coming to three Carnival home ports in the line’s latest round of ship repositionings. In each case, the new ships will replace other ships sailing the same itineraries. The changes will provide a capacity increase in New Orleans, but will also provide a fresh onboard product for consumers in all three markets. Other cities involved in the three-ship changes are Jacksonville and San Juan. 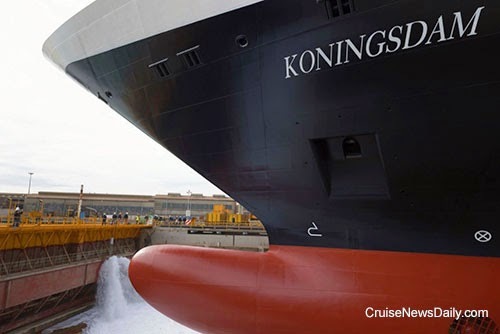 The complete story appears in the March 2 edition of Cruise News Daily. Royal Caribbean said today that it will sell the 1996-built Splendour of the Seas to TUI Cruises during the second quarter of 2016. TUI will then lease the 69,130-ton ship to Thomson Cruises. Splendour's final sailing for Royal Caribbean will begin on April 4, 2016.